CASE takes advantage of its best in class powertrain technology to deliver superior track power combined with outstanding blade force through the turns. 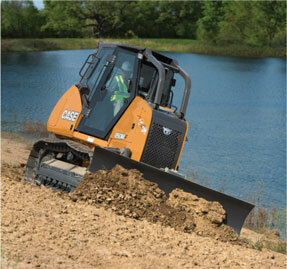 Both tracks are independently powered when turning to increase material retention and productivity on the jobsite. Best in class drawbar pull and class leading horsepower come standard to offer the ideal machine for any job. CASE dozers utilize Cooled Exhaust Gas Recirculation (CEGR) or Selective Catalytic Reduction (SCR) technology in Tier 4 Final machines. The 750M relies on CEGR, where exhaust gases are cooled, blended with fresh air and then returned to the cylinder, lowering combustion temperatures and dramatically reducing NOx. Particulate matter is then reduced through the use of a Diesel Particulate Filter (DPF) system, resulting in improved fuel efficiency and reduced downtime. The rest of the line employs SCR technology to meet Tier 4 emission standards. SCR requires no regeneration and no new filters. Just add Diesel Exhaust Fluid (DEF) when you refuel, and you're ready to go.